The Internet is buzzing about Amazon Go, Amazon’s new self-service grocery store. At the flagship Amazon Go in Seattle, opening in January 2017, anyone with an Amazon account, a supported smartphone, and the Amazon Go app will simply take what they want from the store and leave with no check-out required. Customers will then receive a bill from Amazon, which uses a technology called Just Walk Out to detect when products are taken or returned to a shelf. The excitement over the disruptive potential of Amazon Go is justified. 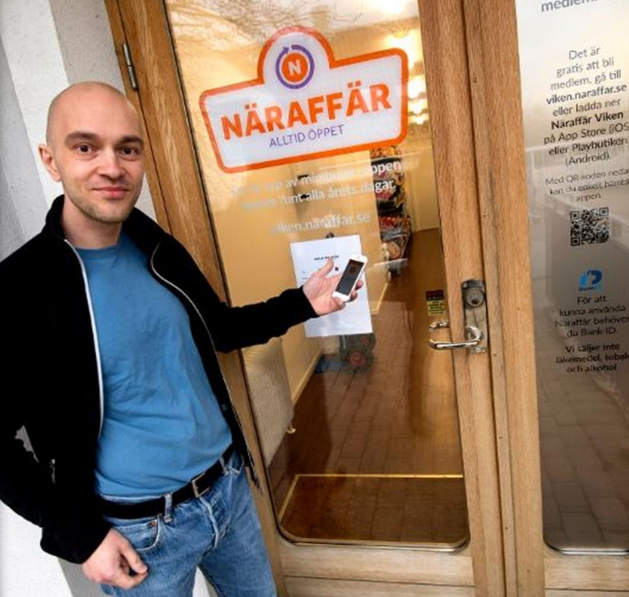 But a small grocery store in Sweden named Naraffar beat Amazon to the punch nearly a year ago. Naraffar’s story illustrates how small businesses can innovate quickly — but how big brands like Amazon can refine an innovation and make it mainstream. Since January 2016, Naraffar, located in the small town of Viken, near the southern tip of Sweden, has been providing unstaffed 24-hour self-service. Customers use a smartphone app to unlock the store’s entrance, take groceries, and leave. Customers receive a bill later. Customers can also influence how Naraffar stocks its inventory by requesting items not in stock. An enterprising Viken resident named Robert Illijason opened Naraffar after he noticed an unmet customer need: his own. After dropping his last bottle of baby food by accident, he needed to replenish his supply pronto. But the accident occurred when all stores were closed in the 4,200-town of Viken. Only after driving miles to another town did he find a store open. In the aftermath of the experience, he wondered: why not open a 24-hour store in Viken? But the cost of hiring people to operate the store around the clock turned out to be prohibitive. So he designed a store that requires no people — not even to open or close the front door. So far, Naraffar has succeeded as a small-scale, 7-11 type convenience store that offers staple items on demand, such as diapers and milk. Ilijason reports no issues with shoplifting. Customers need to identify themselves through Sweden’s BankID system. Security cameras monitor the store, and if for some reason the front door remains open for longer than 8 seconds, Ilijason receives an alert. As noted by Tarunika Tolani of the Harvard Business School, Naraffar is a natural progression from click-and-collect buying, in which customers order what they want online and pick up goods in brick-and-mortar stores. The number of click-and-collect points in Europe grew by 20 percent in 2015, especially in the United Kingdom, where London alone can accommodate several collection points. Whether he realized it, Ilijason was tapping into a larger trend in consumer behavior by opening a store that removes a layer of friction from an increasingly popular click-and-collect approach. But Naraffar lacks scale. Amazon possesses the scale, brand strength, and resources to make the Amazon Go model a mainstream experience. As is so often the case, start-ups can experiment and innovate. But the big brands such as Amazon can take innovation to another level. Amazon can test, learn, and refine an idea, whether its own or someone else’s. For instance, Naraffar requires shoppers to scan items with their smartphones and then confirm purchases — a two-step process. Amazon Go customers literally pick up their inventory and leave without any scanning their devices. Naraffar offers limited inventory in a small location. Amazon Go’s flagship facility resembles a convenience store (with 1,800 feet), but already Amazon is exploring multiple grocery store formats, including much larger facilities, according to The Wall Street Journal. Even Naraffar required the cooperation of a big brand to launch: Apple needed to approve its app for the smartphone technology to work. In the United States, retailers are experimenting with several models that might exist alongside each other, including self-service stores of various sizes; variations of click-and-collect (see Walmart’s Pickup and Fuel concept stores, where customers order online and then drive to Walmart to have their groceries loaded into their cars by employees); and delivery on demand (which Walmart has been famously piloting with Lyft and Uber). An independent self-service store relying completely on an app might be a better fit for a remote small town that requires fewer goods and exists. But I could see Amazon building larger Amazon Go stores (certainly larger than 1,800 square feet) in cities where a critical mass of shoppers and infrastructure exists to support a bigger store. Retailers such as Walmart and Amazon will continue to experiment with different store formats. 2017 is already shaping up to be an exciting year. Business Insider, “This 24-Hour Convenience Store in Sweden Doesn’t Have a Single Employee — Here’s How,” by Chris Weller, 29 February 2016. The Huffington Post Canada, “Naraffar, Unmanned Swedish Grocery Store, Open 24 Hours,” by Emma Prestwich, 16 March 2016. Reuters, “Broken Baby Food Jar Leads to Sweden’s First Unstaffed Grocery Store,” by Ilze Filks, 14 March 2016. Brian Solis (via LinkedIn), “Amazon Go Brings Retail Experience into 21st Century,” 6 December 2016. The Wall Street Journal, “Amazon Working on Several Grocery-Store Formats, Could Open More Than 2,000 Locations,” by Laura Stevens and Khadeeja Safdar, 5 December 2016. This entry was posted in Customer Service and tagged Amazon, Amazon Go, David Deal, location marketing, Naraffar, Pickup and Fuel, retail, Superhype, Walmart. Bookmark the permalink.